After the Partition of India in 1947, the two nascent countries of India and Pakistan each faced the difficult task of nation-state consolidation; however, Pakistan's problem was exacerbated by the fact that it had been geographically divided even further with its East and West sections "separated by over 1000 miles of Indian territory"1. The emergence of the People's Republic of Bangladesh (formerly known as East Pakistan) as an independent nation-state in 1971 therefore represents a significant case among modern countries because Bangladesh's seemingly mutually reinforcing identities of "nation" and "state" were in fact quite separate from the period 1947-1971. In Coercion, Capital, and European States, Charles Tilly suggests that the predominant factor behind the rise of European nation-states was war. He argues that complex institutions of capital generation as well as features of the contemporary nation-state such as taxation were created in order to increase the effectiveness of war-mongering. In The Sources of Social Power, Michael Mann suggests the significance of an additional factor, nationalism, in the determination of political developments. This study aims to demonstrate that nationalism was by far the most important variable that influenced the rise of the Bangladeshi nation-state, insomuch that political grievances of East Pakistan against West Pakistan were defined primarily as threats to the concept of the Bengali nation. Since many state aspects including territorial boundaries, centralized government, and bureaucracy had already been established in both East and West Pakistan by the British during the Partition, the issue of autonomy largely served as the point of division between the two provinces of Pakistan. Mann's theory successfully explains the critical ideological divide between the provinces because it accounts for the most important factor of Bengali nationalism that originally caused citizens in the East to distinguish themselves as separate from those in the West. On the other hand, the emergence of Bangladesh also partially supports Tilly's theory, as the proximate cause of independence was violence in the 1971 Bangladesh Liberation War. However, Bangladesh ultimately diverges from Tilly's long-term model because warmaking was never East Pakistan's primary concern; this study aims to demonstrate that the desire for an independent Bengali nationstate was a relatively late development caused by perceived cultural imperialism from West Pakistan. Moreover, although institutions of capital generation had already been established post-partition, East Pakistan remained an extremely weak military power, and the latter part of this study will illustrate that Bangladesh's independence would have been highly unlikely if it were not for the successful intervention of an external force: India. For this reason, Mann's model is far more useful than Tilly's because it explicitly accounts for this sense of unified Bengali identity. Tilly's analysis is too reductionist with regards to the emergence of Bangladesh, since the state and its corresponding institutions were not formed with the primary objective of war-mongering. Indeed, East Pakistan's need for India's aid in fighting West Pakistan in 1971 demonstrates that warfare was mainly an afterthought for the would-be Bengali nationstate. Therefore, the rise and consolidation of Bangladesh from a "nation" and a "state" into a nation-state primarily required a strong sense of Bengali national identity, while the Indo-Pakistani War of 1971, which ultimately resulted in Bangladesh's independence, was only the final event that solidified its status as an independent entity. The Indian subcontinent is home to a wide variety of ethnicities and cultures, so language became an increasingly distinctive mark of identity as regions began to view themselves as distinct from each other due to the declining unifying authority of the British Raj. In many ways, this process is analogous to Mann's European theory of nation formation based on vernacular languages and the decline of the unified Catholic Church. Therefore, both India and Pakistan were faced with the inherent paradox of attempting to consolidate various regional identities into a unified national identity. However, East Pakistan diverged from the overall path of West Pakistan and began to develop a unique regional identity at odds with West Pakistani goals that would eventually emerge in 1948 as the independent nation-state of Bangladesh. The Bengali language was in a unique position compared to other languages of Pakistan commonly spoken in the West, such as Punjabi or Sindhi, because it was used by a majority of citizens and was the foundation of a cultural elite both geographically and historically separate from the Urdu-speaking aristocracy in the West6. Indeed, East Pakistan's language suggestion was not unreasonable since Bengalis constituted about 55% of Pakistan's overall population7, and the people naturally assumed that the preference of the majority would be adequately represented in Pakistan's theoretically democratic government. In addition, Bengali was capable of having institutional status because it had a strong literary tradition from intellectuals during the British Raj. In contrast, languages of West Pakistan, aside from Urdu, were generally confined to villages and developed multiple dialects.8 Because of these facts, East Pakistan presented a unified platform of resistance against the Urdu single-language proposal and further suggested that Bengali be instituted as a national language alongside Urdu. These proposals were summarily rejected by the ruling government of West Pakistan.9 Stirrings of Bengali nationalism began with this incident, since nearly all East Pakistanis became united by their common language and their collective discontent with the policy of West Pakistan. Therefore, the "nation" and the "state" were separate since East Pakistanis (read: Bengalis) formed their own "limited imagined community"10 on the basis of common language and ethnicity, while they officially remained as part of the Pakistani state without distinctive political representation. Based on a demographic analysis alone, the only cultural commonality between the two sections of Pakistan was their overwhelming Muslim-majority population. West Pakistan attempted to capitalize on this fact and unify both halves under the banner of Islam. Unfortunately, West Pakistan's rationale for rejecting East Pakistan's language counterproposal only served to further drive a wedge between the two sections. Urdu-speakers claimed that since all of Pakistan was established as an "Islamic Republic", it should represent Muslim culture as best as possible. Urdu was linguistically related to and was written in the same script as the traditional Islamic languages of Arabic and Persian. As a potential compromise, West Pakistan suggested significantly "reforming" the Bengali language so it would have less of its Hindu influence.11 This proposition inflamed the vast majority of East Pakistanis, 83% of whom were Muslim12, since West Pakistan had not only rejected their language on its own merits, but also claimed that Bengali Muslims were inferior simply because their language had a significant linguistic influence from Sanskrit rather than from a traditionally Islamic language. For these reasons, it became increasingly apparent that Pakistan's national identity predicated on religious commonality was insufficient for unifying the country. To complicate matters further, the government of West Pakistan attempted to institute its "reforms" of Bengali despite protests in the East that the program threatened Bengali culture and identity. For a short time, schools taught Bengali written in Arabic script (rather than its original unique script), and attempted to replace Sanskrit-derived words with those from Arabic or Persian.13 Student protests eventually put an end to this program. Bengali nationalism again became stronger as a result of language conflict, and began to supersede any possible religious similarities between the East and West. In this way, the rise of Bangladesh also deviates slightly from the Mann's theory. In Mann's analysis, an important factor in creating national consciousness in European states was the presence of a common religion like Calvinism, Catholicism, etc. ; in contrast, East Pakistan developed national consciousness in spite of religious commonalities between itself and West Pakistan by focusing exclusively on ethnic and linguistic commonalities. Indeed, East Pakistanis increasingly viewed themselves as primarily Bengali rather than Pakistani. This sentiment was strengthened even further by West Pakistan's revival of the national language issue in 1952. The original conflict had never been resolved, and in January 1952, the Muslim League (the ruling party, based in West Pakistan) suddenly declared that Urdu would be the sole official language. East Pakistanis understandably felt disenfranchised from the political process. In clear defiance of West Pakistani orders, students in Dhaka University held a mass protest against the proposal on February 21, 1952. In contrast, West Pakistanis were increasingly characterized as evil and oppressive. As a result, citizens of East Pakistan began to celebrate their Bengali heritage to an even greater extent. 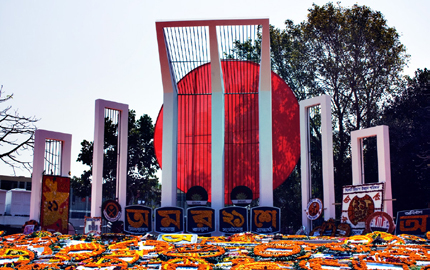 For example, obscure traditions such as Bengali New Year became celebrated by the majority of the population, and people would gather annually at Shaheed Minar to remember the fallen students and sing ethnic Bengali songs.17 While many Bengali traditions had existed long before the Partition of India and Pakistan, they were suddenly brought into the mainstream as symbols of Bengali unity and as a reaction against West Pakistan. Moreover, "traditions" of honoring student martyrs were essentially invented after the language conflict; this further highlights that although the concept of a distinct Bengali nation was "imagined", it was by now firmly entrenched in the minds of East Pakistanis. 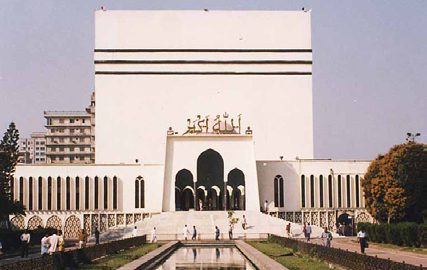 As a result of the first language conflict in 1948, a new East Pakistani political party called the Awami League had been formed in 1949 that would serve as a counterweight to the Muslim League of West Pakistan.18 Although the party was originally founded as the Awami Muslim League (designed to represent Bengali Muslims), the religious aspect was dropped in 1955 in order to emphasize that it was a party for all of East Pakistan, regardless of religion.19 In fact, Awami League leaders stated that the primary goal of the party was to advance Bengali interests.20 The formation of this party is a critical event in the rise of the Bangladeshi nation-state, since it is the first instance of East Pakistanis attempting to gain autonomy on the basis of their own "imagined community". They did not want to be subject to the whims of a government in West Pakistan that seemed to discard their preferences. The major reason that Bengalis were denied adequate representation in the government was the existence of a strong executive branch established under British rule. In this system, the vast majority of political power was concentrated in the civil service and the military, as these two arms were primarily responsible for implementing laws.21 Unfortunately, the ethnic groups that held these positions were primarily those who had held them under the British, notably Punjabis of West Pakistan. Indeed, racial discrimination played a role in the selection of civil servants and soldiers. Punjabis are known as fierce warriors because of their immense height inherited from their Afghani tribe ancestors, and their religion's focus on bravery and strength in battle. Indeed, "in Punjabi society, a respect for military precision, administrative talent… and Western social practices were dominant".22 In contrast, Bengalis are descended from the shorter natives of the Indian subcontinent, and tended to focus on studies in liberal and fine arts, notably language, music, and poetry. However, these cultural differences caused some "West Pakistani [people to] see the Bengalis as a ‘lazy' and ‘talkative' folk".23 For this reason, Bengalis were stereotyped as weak, and therefore very few of them were selected for army or civil service by the government headquartered in West Pakistan. The formation of the Awami League also represents the first expression of a desire for the Bengali nation to be married to the concept of regional autonomy. The Awami League ran on a platform of federalism, the devolution of powers and advocated reforming the political system to give East Pakistan (and by extension, ethnic regions in both sections of Pakistan) adequate representation in all branches of government. In this sense, this event was a precursor to the consolidation of the Bangladeshi nation-state. Nevertheless, it is important to note that at this point in history, East Pakistanis had no desire to be independent from West Pakistan. Bengali national consciousness was undoubtedly thriving, but East Pakistani leaders had still not conceived the idea of separating themselves completely from West Pakistan. They were primarily concerned with autonomy, and having their preferences represented adequately in a democratic fashion. So far, this study has attempted to demonstrate that nationalism was the primary factor in causing the development of an East Pakistani regional identity separate from that of a unified Pakistan between 1947 and 1971. However, the cry for an independent Bengali nation-state only began towards the end of this period. The next section of this study will attempt to provide an alternative to Tilly's theory of nation-state formation by illustrating that the primary user of violence in Bangladesh's case was India, an external rather than internal force. Anderson, Benedict. Imagined Communities: Reflections on the Origin and Spread of Nationalism. London and New York: Verso, 1991. 1-46. Print. “Islamic Republic of Pakistan: Language.” CultureGrams World Edition. ProQuest, 2011. Web. 13 April 2010. GlobalSecurity. GlobalSecurity.org, 1984. Web. 10 Apr 2011. <http://www.globalsecurity.org/military/library/report/1984/KRG.htm>. Mann, Michael. The Sources of Social Power: The Rise of Classes and Nation-States, 1760-1914. 1993. 214-51. Print. Muhith, Abul Maal Abdul. American Response to Bangladesh Liberation War. Dhaka, Bangladesh: University Press Limited, 1996. 37-62. Print. Qureshi, Hakeem. The 1971 Indo-Pak War. Oxford, UK: Oxford University Press, 2002. Print. Tilly, Charles. Coercion, Capital, and European States A.D. 990-1990. Oxford, UK: Wiley –Blackwell, 1990. 19-33. Print. Uddin, Sufia M. Constructing Bangladesh: Religion, Ethnicity, and Language in an Islamic Nation. Chapel Hill, NC: University of North Carolina Press, 2006. 117-55. Print. Umar, Badruddin. The Emergence of Bangladesh: Class Struggles in East Pakistan (1947-1958). 1. Oxford, UK: Oxford University Press, 2006. 108-11. Print. Umar, Badruddin. The Emergence of Bangladesh: Rise of Bengali Nationalism (1958-1971). 2. Oxford, UK: Oxford University Press, 2006. Print. United States. Department of State: Bureau of Central and South Asian Affairs. Background Note: Bangladesh. Washington: Department of State. Web. 10 Apr 2011. Department of Defense: Near East South Asia Center for Strategic Studies. An Atlas of the 1971 Indo-Pakistani War: The Creation of Bangladesh by John H. Gill. Washington: National Defense University Press. Print 10 Apr 2011. Weber, Max. “Politics as a Vocation.” Free Students Society. Munich University, Munich, Germany. Jan 1918. Lecture.